When the back of the train reached the heart of the (Swan) valley, the resultant Darjeeling Limited-like collaboration turned into a subcontinental spiced mango lassi IPA. 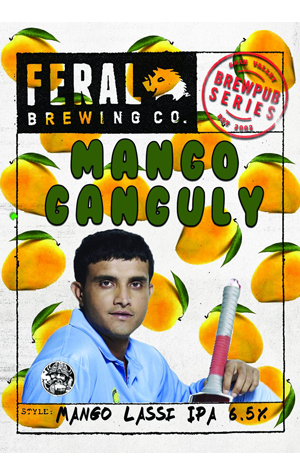 Taking its name (well, half of it) from the former Indian captain and inspiration from his homeland, it's a beer that manages to retain Ganguly's elegant balance despite piling 200g of uncracked cardamom, freshly pulped mango and lactose into the 1000 litre batch. The last of these contribute to a creamy mouthfeel while the fruity vibe is accentuated by the use of Australian and New Zealand hops, which add a dryness to the finish too. The fervour for Mango Ganguly saw five kegs blow at Caboose in the first week after its launch, suggesting Perth drinkers are ready for an Indian summer. You can still find the limited release pouring at Feral's Swan Valley brewpub and at Caboose, with growler fills available from both.